We’re right in the middle of flu season, and despite our best efforts, sometimes we get sick no matter what. 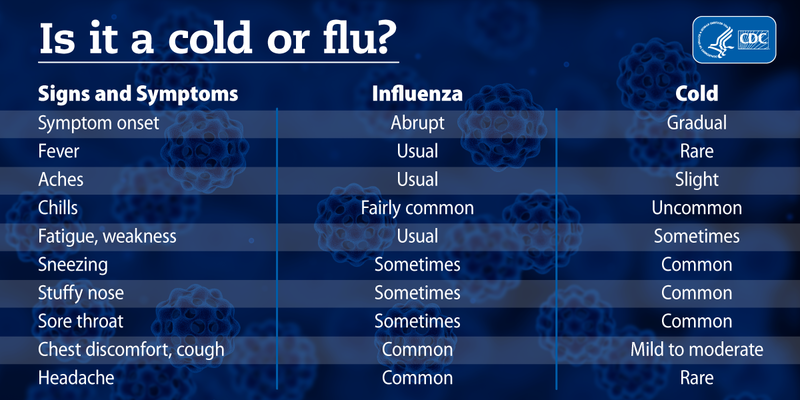 How can you know if what you have is the flu or just a common cold? They’re both respiratory illnesses and share many similar symptoms. The simplest way to look at it is that, generally, the flu has more common and intense symptoms; colds are usually milder. People with colds are more likely to have a runny nose and a more gradual onset of symptoms. People with the flu are more likely to have chills, fever, headache, shortness of breath and weakness. These flu symptoms also tend to occur much more suddenly than cold symptoms. Young children, people 65 and older and pregnant women are all more at risk for flu-related complications and are advised to see their doctor or health specialist as soon as symptoms appear. For more information on what to do if you get sick, visit this helpful page on cdc.gov. In either case, it’s always best to avoid contact with others, stay home, get good amounts of rest and drink plenty of water.